Food will be a big concern when organising your budget at university and it's something a lot of people don't really take into account. However, if you spend wisely and shop in the right places at the right time, you should be able to save some money and still eat really well. There's no point in everyone in the house going shopping separately and coming back with the same items. Likewise, there's not much point in just one person going to do the main shop and then not buying sufficient food. The key is to plan in advance: sit down with all your housemates (if it's possible to get everyone in the same place at the same time!) and write a comprehensive list. This means checking in the cupboards and the fridge and working out if people are going to be at home a lot in the coming week, in which case you'll probably need more food. Once you've done this, you're ready to go shopping. For ease and convenience, most people just go to their nearest supermarket for the big weekly or fortnightly shop. It's true that you'll generally get everything you need under one roof, you can drive (if you've got a car) and you'll even get help packing up your bags but this isn't your only option by any means. If you're just a little bit more organised and are prepared to shop a bit more often, you'll get so much more out of the experience. Most large towns have a market or a fruit and veg stall, so why not buy all your fresh fruit and vegetables from here instead? Prices can be very competitive and you'll often find bags or scoops of certain vegetables far more cheaply than their supermarket equivalent. You also get to have a natter to the people selling you the food and you're supporting small suppliers rather than big retailers - what are you waiting for? Again, most towns will have a fruit shop, a butcher and bakery and you might be surprised at the prices. Look out for special offers or ask about cheaper (but not inferior) cuts of meat from your butcher. Obviously the supermarket is handy for all those big, bulky items and for special offers. It's convenient to take the car and load up on canned food, dried goods, toiletries and bottles etc and there's no problem taking advantage of special offers on non-perishable items. But why use your petrol and time when you can order your shopping online and get it delivered? Online shopping means you don't all have to trek to the supermarket: you can sit in front of the telly and order, with everyone having an input. Some supermarkets offer free delivery if you book certain weekday slots, which is perfect for students studying (?!) at home. You should still be able to get the same offers as in store, as well. The oldest trick in the book is to wait until just before closing time to go shopping. However, this isn't quite the guaranteed bargain hunting ground it used to be. Many supermarkets are now open 24 hours a day so there isn't such a mad rush to get rid of stock. However, you'll still find plenty of bargains in smaller outlets. Market traders are usually only too pleased to offload unsold items at knockdown prices, as closing time approaches. 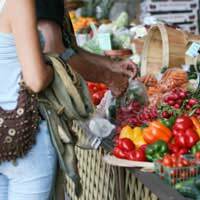 If it's a weekly market, or a daily one that shuts the following day, you should be able to really stock up on affordable goodies. It's possible to eat well on a tight budget if you know where and when to shop and make the most of local traders. You'll have to put a bit more thought and effort into your food shopping but it will be worth it for a bowl full of fresh fruit and a fridge packed with lovely seasonal vegetables bought at a fraction of the normal price!